Arsenal have made a very big mistake by agreeing to let one of their players leave the club at the end of the season, according to a former Manchester United star. 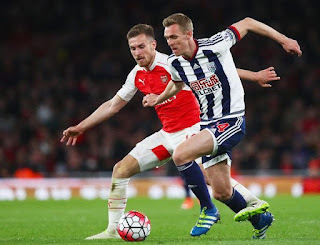 Darren Fletcher is shocked that the Gunners sealed a pre-contract deal to effect a Juventus transfer for Aaron Ramsey by the coming summer. The Welshman who is in his eleventh year at the club has become an integral part of the squad since joining from Cardiff in 2008, which is why many have questioned the decision to discard him. The three-time FA Cup winner's refusal to extend his contract that will expire a few months from now opened the way for the Serie A giants. Upon passing a medical earlier in January, Ramsey got a bumper contract at Juventus that will see him earn a whopping ￡400 000-a-week wage. It is known fact that his departure will leave a void in the Arsenal midfield - a fact Fletcher reiterated in a recent interview. “A couple of years ago I thought he was the best midfielder in the Premier League, he’s had a couple of injuries since then and he’s been trying to get his form back", he said. “But even so, I saw one of the goals the other night and his recovery run was incredible. He’s meant to be a number ten or a ‘luxury midfielder’, but he was running past other midfielders and sprinting all the way back trying to recover from the team. That’s a guy who is not going to be there next season!" “I think it’ll be a big mistake from Arsenal to let him go." “When you’re willing to let a player go for nothing and a team like Juventus come in and take him, you’ve got to start scratching your head and think something might not be quite right there." Ramsey's departure from the Emirates Stadium is itchy but more painful is the reality that he will be leaving for free.